Policy changes leading to greater access have not occurred spontaneously. It has taken years for the rights of people with disabilities to be recognized. For decades, activists have advocated for the removal of barriers so that people with disabilities can participate fully in society. This advocacy has often taken the form of civil disobedience. Members of the Disability Rights Movement have been involved in boycotts, blocking traffic, protest marches, and sit-ins. All of these protests closely mirror the tactics used in the broader Civil Rights Movement, and with much of the same success. Protests bring about awareness of a problem to the wider community-in this case, the injustices and unfair treatment of people with disabilities. A protester who uses a wheelchair holds up a sign that says "Fix The System: Not Me." For many activists, the fight for the rights of people with disabilities centers on changing the attitudes of society and removing barriers, not "fixing" the person with a disability. Many issues are at the heart of disability rights protests. Activists call for fair employment standards, for the removal of physical barriers, and for the right to independent living. Protests are often held in support of a particular change or piece of legislation, such as demonstrations that called for the ratification of the Rehabilitation Act of 1973. The publicity from protests and the pressure they apply can lead to local, state, and national change. Members of ADAPT crawl up the steps to the U.S. Capitol. Members of ADAPT crawl up the steps to the U.S. Capitol building, demonstrating that the building is far from accessible to all American citizens. 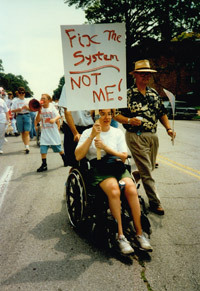 ADAPT is known for their dramatic demonstrations. 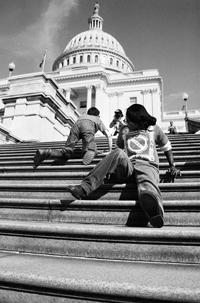 The Capitol Crawl in Washington, D.C., occurred in 1990 as members of ADAPT pushed out of their wheelchairs and struggled up the steps of the United States Capitol. With this dramatic action they demonstrated the inaccessibility of one of the defining monuments of American equality and justice. With no access ramps, this public building was essentially closed to them, as were many other buildings. A group of people in wheelchairs gathers in front of a Greyhound bus with signs that read "All Aboard," "We will ride," and "Lifts on Hounds." Public transportation is a major issue for the Disability Rights Movement. For a long time, and to an extent today, many modes of public transportation are inaccessible for people with disabilities. Here protesters protest for bus lifts on St. Louis Greyhound buses. In St. Louis, curb cuts and bus lifts have been among the most contentious issues. Max Starkloff, Jim Tuscher, and others worked for accessible public transportation, especially urging the local bus fleet to add lifts to all their vehicles. Protests were finally successful, although fully accessible and convenient transportation are ongoing battles in the city. The work of disability rights advocates often begins at home. Parents and family members of people with disabilities were at the forefront of the fight for equal rights. Organizations like the National Association for Retarded Children (founded in 1953 and now renamed The Arc of the United States), were founded by the mothers and fathers of children with disabilities to fight injustices in school systems, keep their children from being institutionalized, and to receive the funding necessary to provide an appropriate level of care. Max Starkloff, Representative Richard Gephardt, Colleen Kelly Starkloff, and Jim Tuscher stand together downtown in the shadow of the St. Louis Arch. 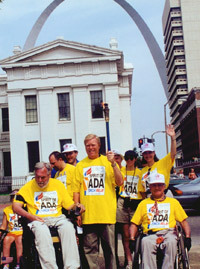 Gephardt holds aloft the torch from Spirit of the ADA Torch Relay. Max Starkloff, Colleen Kelly Starkloff, and Jim Tuscher are all leaders of the Disability Rights Movement in St. Louis, and here they take the opportunity to celebrate the successes that have been achieved by their activism in the Spirit of the ADA Torch Relay. The successful passage of legislation is not the end of the fight. Change is still sometimes slow to happen. Threats of legal action and lawsuits are other methods activists use to spur on change. Many businesses and public places have worked toward compliance with sections of the Americans with Disabilities Act and other legislation as a result of lawsuits. Changes are being made as a result of the work of protesters who are not willing to give up the fight for the rights of people with disabilities. Many physical and societal barriers have been removed. However, there are still major obstacles to be conquered, and protestors will continue to be at the heart of the push for improvement.